True to form, Bali’s best restaurants have taken this Hawaiian staple and made it their own. 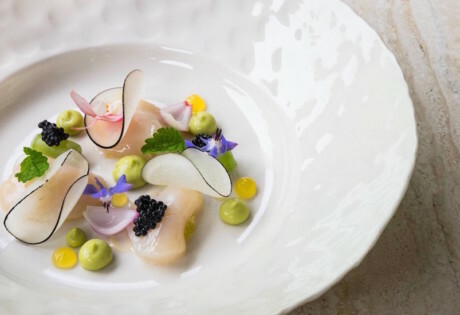 Some have recreated the classic, while others have gone above and beyond with creative twists on the traditional – and the results are “ono” (that’s delicious in Hawaiian, FYI). So without further adieu, here are the best spots around the island to get your Poke fix on. This might just be our most colourful roundup yet…. 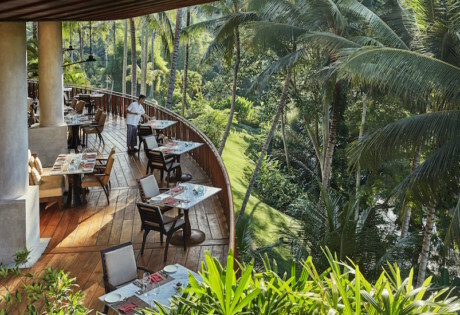 Brunch o'clock: It's Canggu's best cafes! Roll up, roll up, to our fave little Seminyak cafe, cocktail & coffee den. 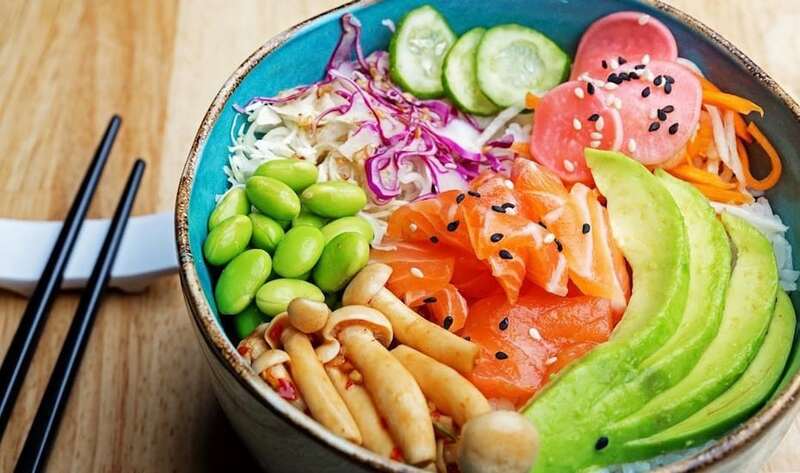 There’s a whole circus of delish dishes on the menu here, but one of the total standouts is Sea Circus’ Summer Poke Bowl. It’s a heady, gluten-free mix of sashimi-grade tuna marinated in a citrus ponzu dressing, served with quinoa, edamame, avocado, radish & wasabi mayo. For the vegetarians out there, switch up the tuna for marinated tofu and you’re all set for a vegan feast of epic proportions. Sea Circus, Jl Kayu Aya No 22, Seminyak, p. +62 361 738 667, e. ringmaster@seacircus.com. Open daily 7am – midnight. 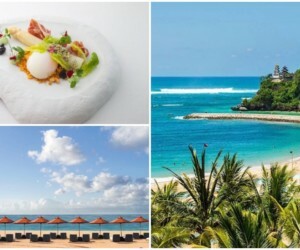 Turn up the Poke swank at Seasalt – the super chic beachfront restaurant at Alila Seminyak. Inspired by the sea, you can expect a whole host of fruits de mer here, including a scrummy selection of bowls. The Red Rice, Pork or butter-soft Gindara are all super tempting, but for the purists, their OG Tuna bowl is simply divine with avocado, kyuri, chirashi rice, and of course, slices of the finest line-caught tuna. 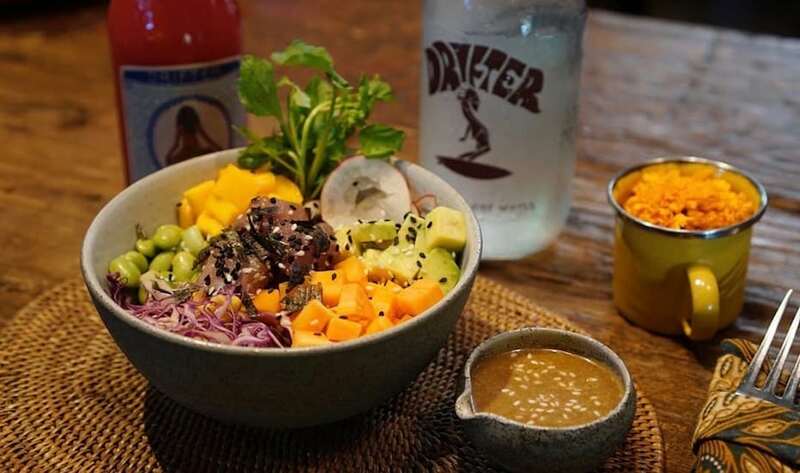 As Seminyak’s trendsetting Melbourne-inspired cafe, it’s no surprise that Sisterfields does the humble Poke Bowl justice – and then some. A glorious mishmash of spicy salmon, edamame, nori, rice balls and gochujang mayo, this creamy, crunchy, gooey dish is next level delicious (best enjoyed with a side of their legendary Polenta Fries – just because). Sisterfields, Jl Kayu Cendana No.7, Seminyak, p. +62 811 3860 507. Open daily 7am – 10pm. We can never go past this coffee icon without stopping in for a quality brew, but it’s not only the beans here that we’re addicted to. 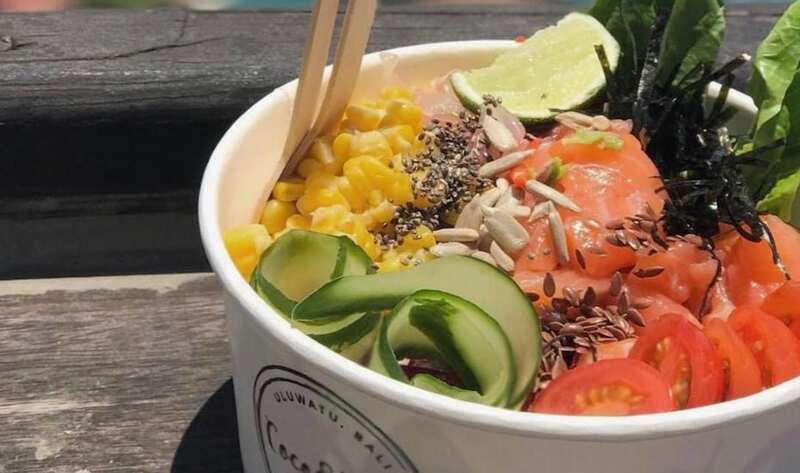 This boutique coffee house also does a mean Poke Bowl, namely its Hawaii Five-O that’s packed to the brim with smoked salmon, organic rice, pickled veggies, chilli and coriander – plus a large latte, obvs. 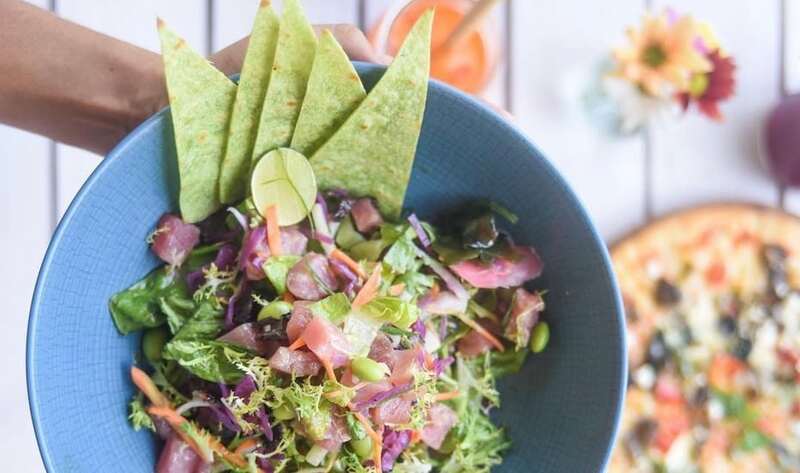 A tropical hideout in the heart of Seminyak, Shelter Bali is like an island oasis, so naturally, they’ve nailed the classic Tuna Poke in all its glory. 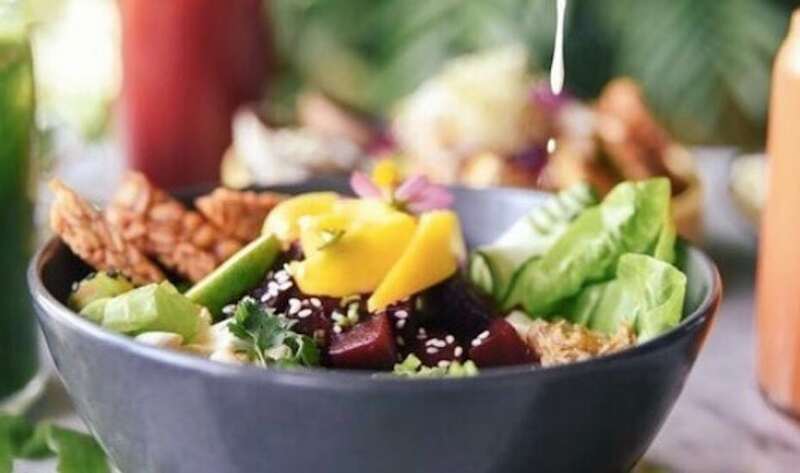 But for the veggie crew, they’ve also created the Miss Poke – a big bowl sans fish with delicious beetroot sashimi (marinated in ponzu), plus quinoa, edamame, tempe, avocado, and looooads of veggies, served with wasabi mayo and fresh lime. YUM. Shelter Cafe, Jl Drupadi 1 No.2, Seminyak, p. +62 813 3770 6471, e. info@sheltercafebali.com. Open daily 7.30am – 6pm. 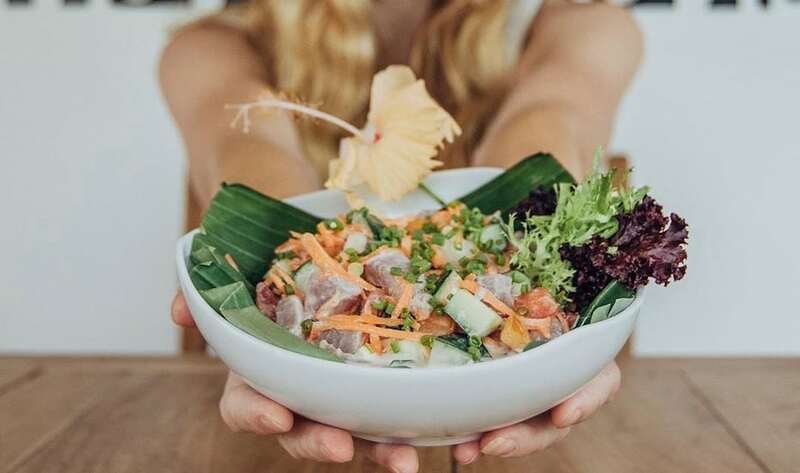 Wholly dedicated to the humble Hawaiian fish “salad”, Pokeh Bali stays true to tradition with a bright and classic Ahi Tuna Poke Bowl, loaded with fresh fish, crispy greens and all the exotic goodness you’d expect. But it’s the variations and local twists here that got our attention. Try the Indonesian-inspired Ayam Sambal Matah Poke with roast chicken and freshly chopped chilli, lemongrass, shallots and garlic, or the Gochujang Poke for a Japanese spice. And of course, for the veggies and vegans out there, try the Tofu & Tempe Poke for some guilt-free grazing. Pokeh Bali, Jl Mertanadi No.86, Kerobokan. Open daily 8am – 4pm. Mudra, Jl Goutama Sel. No.22, Ubud, p. +62 85 738 950 883. Open Tues – Sun 8.30am – 9.30pm. Turns out, the EXPAT. 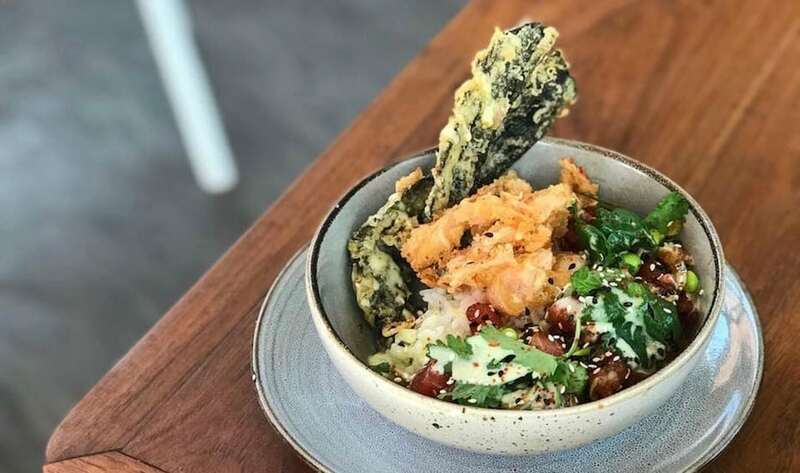 Roasters crew aren’t only coffee connoisseurs – these guys are professional bowl buffs too, nailing a contemporary twist on the classic Poke at their Ubud cafe, Full Circle. 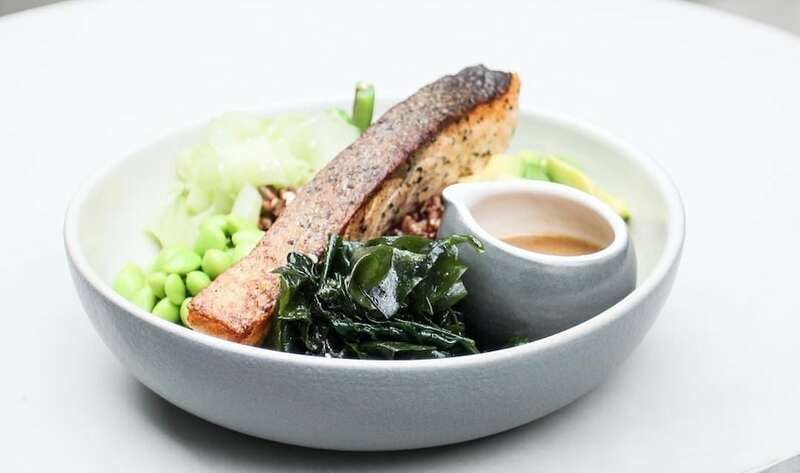 The “Sushi Bowl” here is generously packed with warm brown rice, strips of seaweed, edamame, green beens, and cucumber, then finished with a creamy sesame dressing and avocado. 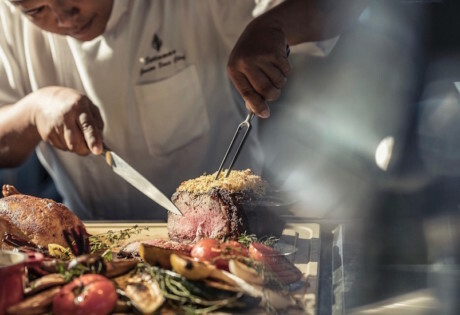 Load it up with either pan seared salmon or tofu steak, and while you’re there, you may as well wash it down with a Tim-Tam Espresso Martini too. Yum! Full Circle by EXPAT. Roasters, Jl Jatayu, Gianyar, Ubud, e. hello@fullcirclebyexpatroasters.com. Open daily 7am – 11pm. This much loved Canggu café has made a second home in Ubud, bringing with it all of our fave Milk & Madu fare. 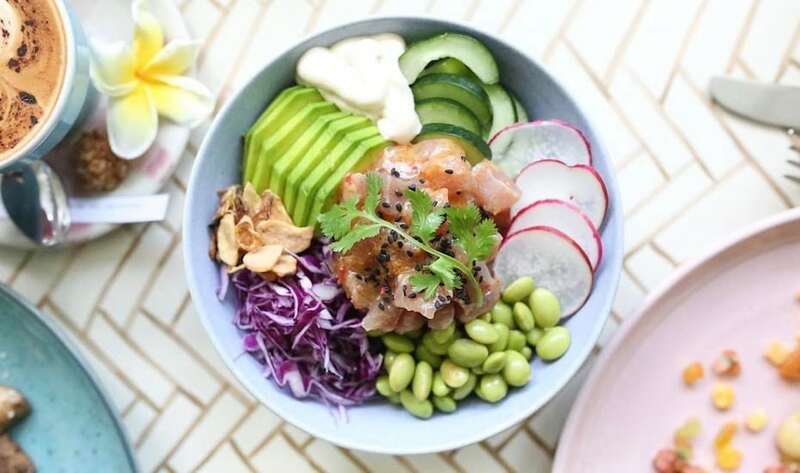 Come for the brekky bowls and stick around for the Poke – it’s a dreamy mix of sustainable, line-caught tuna, edamame, tempura nori, soft avo, spring onion and crunchy veggies with coriander sushi rice – and of course, that tasty ginger ponzu dressing drizzled all over. Say aloha to YUM! Milk & Madu Ubud, Jl Sweta No 3, Ubud, p. +62 812 3673 6733, e. hello@milkandmadu.com. Open daily 7.30am – 10pm. 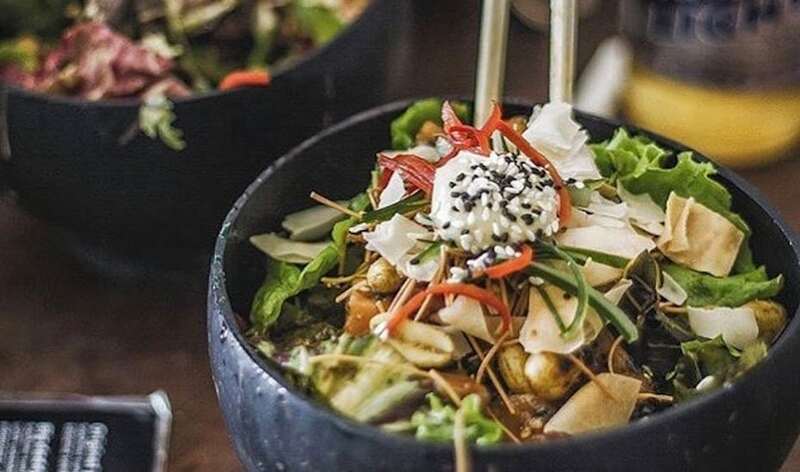 Great food, awesome atmosphere and a pool to chill in after chowing down on their Tuna Poke Bowl – Ubudian Cafe knows how to get our attention! 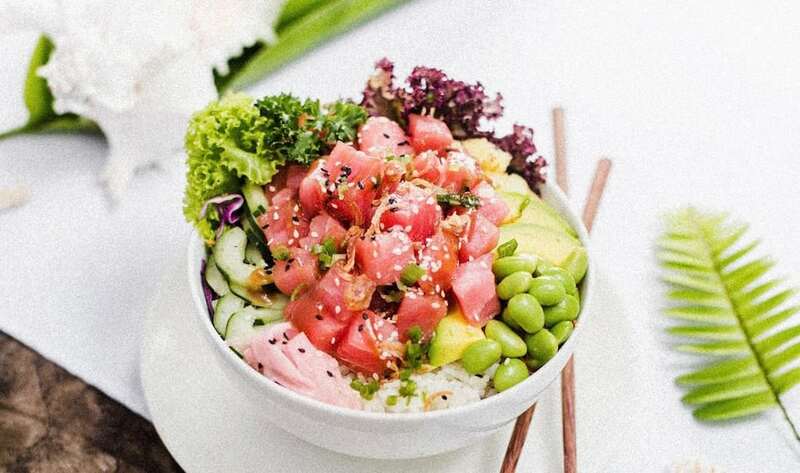 Nestled quietly on the road south outta town, we heart this adorable little café for its healthy food and super duper Poke Bowl that’s light, crisp and loaded with impossibly pink, ocean-fresh Tuna. Ubudian Café Bali, Jl Raya Pengosekan, Ubud, p. +62 812 3756 9849. Open daily 7am – 11pm. Moana Fish Eatery, Jl Pantai Batu Bolong 28, Badung, p. +62 812 3815 8373. Open daily 11am – 11pm. 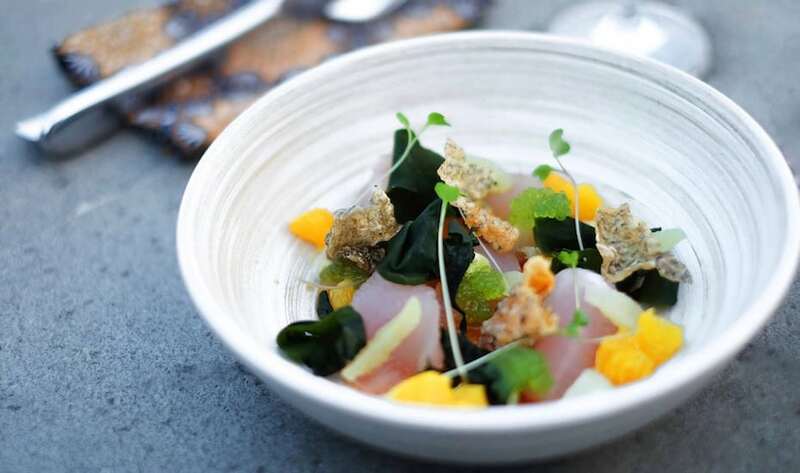 Arguably Canggu’s very best restaurant, Fishbone Local is all about fresh-from-the-net sustainable fish dishes served up within breezy, industrial-chic interiors. 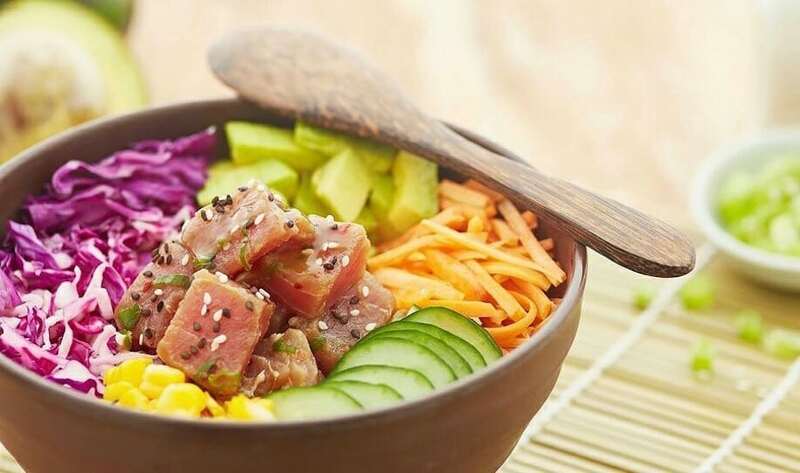 Naturally then, the Poke Bowl is a knockout, loaded with the finest tuna around, farm-fresh veggies and that unmistakeable Fishbone touch that makes this a firm fave, every night of the week. Fishbone Local, Jl Pantai Batu Bolong No. 117X, Canggu, p. +62 361 9342 779, e. info@fishbonelocal.com. Open daily 12pm – late. 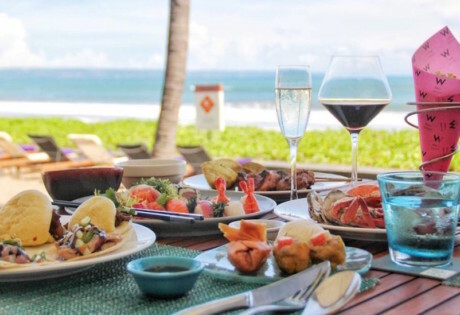 While you should definitely come here for the cocktails, Mai Tai’s Tahitian cuisine is a fish-lover’s fantasy-come-true – an entire menu built around the catch of the day. The Ahi Poke Bowl here is our go-to, with tomato, paprika, sesame seeds, spring onion and Poke soy sauce, plus island vibes and happy hours aplenty. Cheers to that! 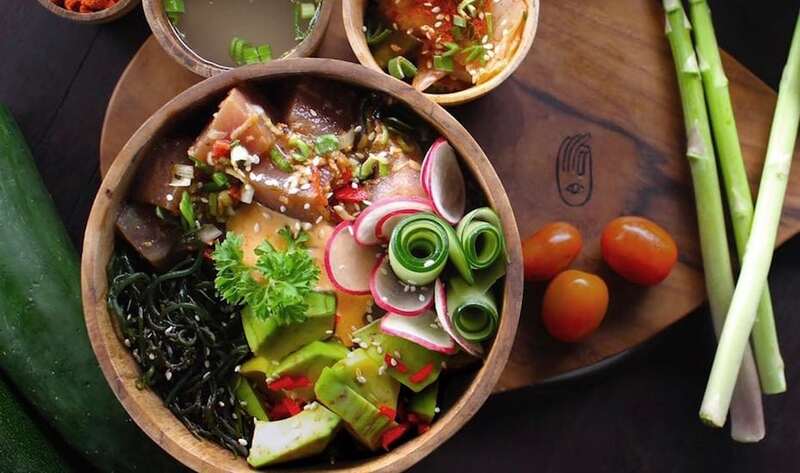 A super cute little eatery right in the thick of Canggu, Poke Poke offers creative bowls custom-made to order (just pick out what you’d like and chow down). Mix up that butter-soft tuna with sesame crusted tempeh, quinoa, edamame beans and super delish dressings for bowls bursting with flavour. Best bit: whilst you wait for your food, you can have a bit of fun by getting dressed up in grass skirts, hula necklaces and having a go on their swing (yes, swing) that sits right in the middle of the little resto. Good vibes all round! Poke Poke, Jl Batu Bolong No.58, Canggu, p. +62 813 3828 5236. Open daily, 10am – 10.30pm. 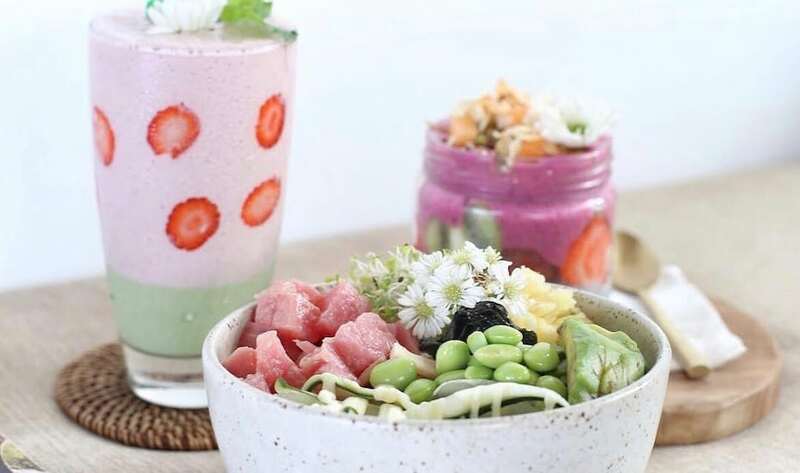 Welcome to the first dedicated matcha café in Bali! This cosy lil’ neighbourhood café serves up (no points for guessing) a menu of matcha-infused goodness, alongside some match-less treats too. 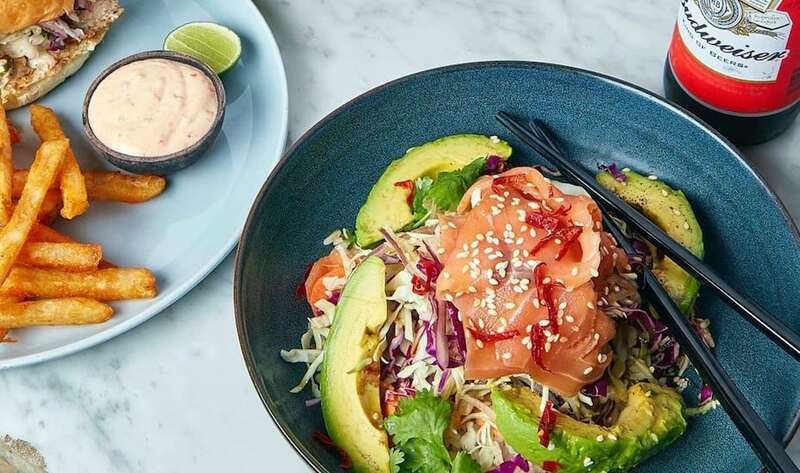 Sitting pretty on the sensational menu is their own take on the classic Poke Bowl, served with Balinese-style sambal matah, or the classic wasabi mayo dressing. Whichever you choose, you’ll love it so matcha! Matcha Cafe, Jl Pantai Berawa No.99, Berawa, p. +62 361 907 8674. Open daily 7.30am – 7pm. Primarily a hand roll sushi bar, this epic little treasure in Canggu also knows how to knock out a solid bowl’o’poke. Select your fave fish (tuna, snapper, salmon or spicy shrimp) or a veggo option (jackfruit, spicy tofu, cucumber + avo), and away you go. Even better news – the prices are super reasonable so there’s no need to break the bank during date night. TYGR Sushi, 999x JI Pantai Berawa, North Kuta, p. +62 813 3916 3894, e. info@tygrsushi.com. Open daily 11am – 11pm. 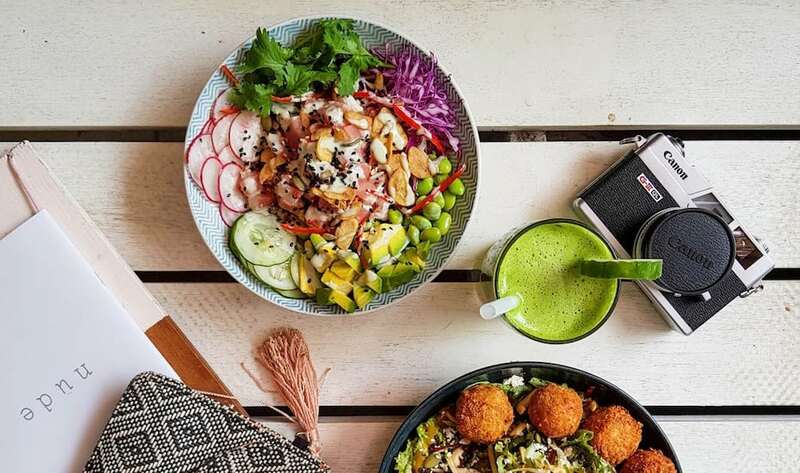 We love this little gem of a café, with its half-raw food half-naughty food menu just up the road from buzzy Berawa beach. The poke here is uh-mayyyyy-zing, knocked out the classic way with sashimi-grade tuna, quinoa, edamame beans, wasabi mayo with ponzu, and a sesame dressing. 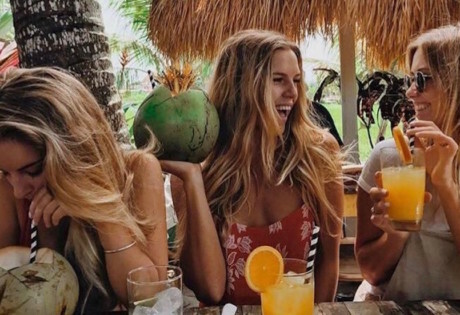 You’ll want to get the Insta-feed at the ready for this one, she’s a true Canggu beauty. The Loft on Batu Bolong had us at hello with its baby pink decor and scrumptious signature dishes from its original Bondi location. 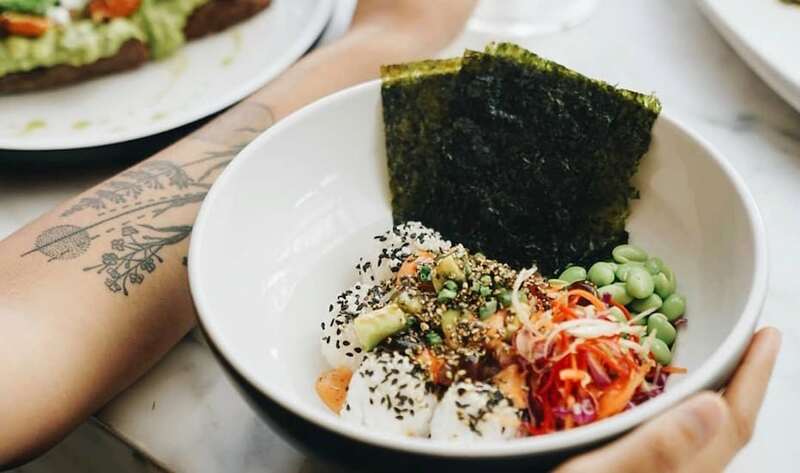 The Loft’s much-loved Poke Bowl is one of those Bondi-born signatures, voted as the best in Sydney by Timeout Magazine. 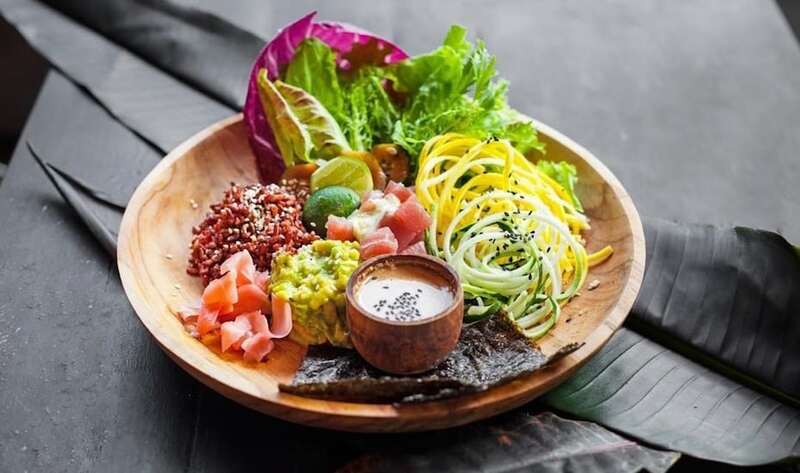 Well, this award-winner has come to Bali in all its glory, complete with chunky Ahi tuna, red cabbage, a sprinkling of quinoa, edamame and heaps of veggies. You can’t argue with that! The Loft, Jl Batu Bolong No. 50, Canggu, p. +62 361 973 310, e. info@theloftbali.com. Open daily 6.30am – 10pm. One of our regular hangs in the ‘Gu, In The Raw Beachgarden rustles up – you guessed it – a selection of healthy, wholesome raw dishes. 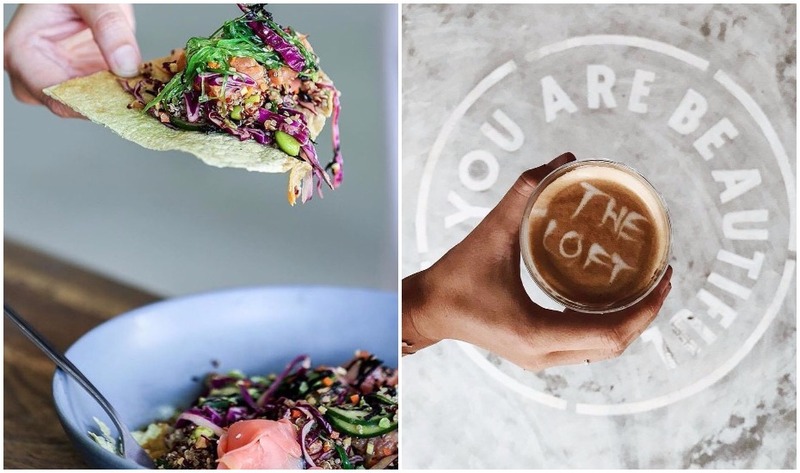 Think brekky bowls, cold pressed juices and of course, their signature Ahi Poke. Gluten free and drizzled in a soya ginger lime marinade (we LOVE the cucumber kimchi btw), this is one Poke Bowl you don’t wanna miss. In The Raw Beachgarden, Jl Pantai Batu Bolong No.103-107, Canggu, p. +62 812 3749 6861. Open daily 7am – 11pm. Bowls, bowls, bowls. 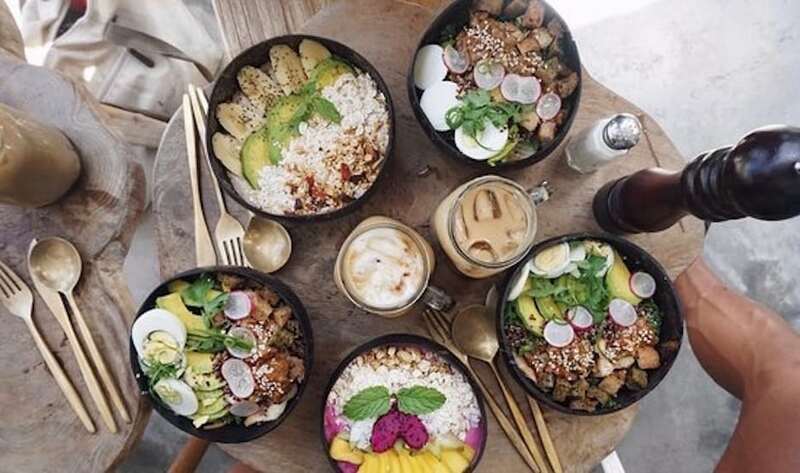 Smoothie bowls, breakfast bowls, Buddha bowls, salad bowls, signature bowls and of course, Poke Bowls. Nutritious, delicious and packed to the bowly brim, our fave is the Berry Snappy Poke Bowl with red snapper, kale, spinach, mint, coconut milk, cherry tomatoes and mixed berries. Yup, we like big bowls and we cannot lie! Bali Bowls, Jl Segara Perancak, p. +62 361 3350092. Open daily 7.30am – 10pm. 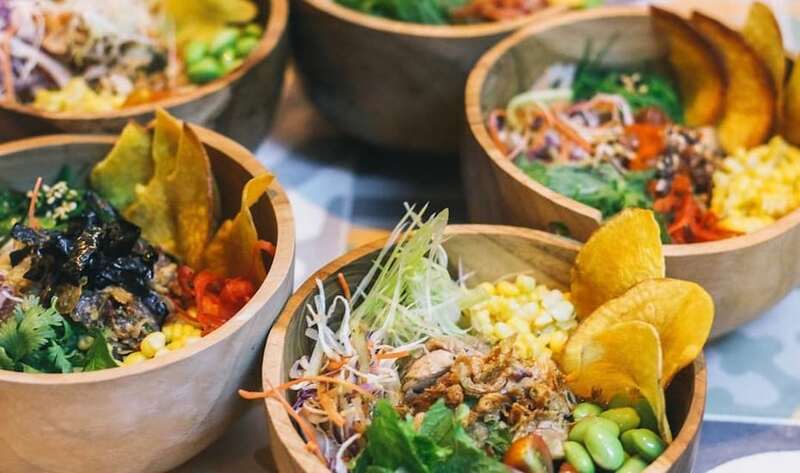 Doing exactly what it says on the tin, this stylishly simple concept counter-housed within Uluwatu’s famed Single Fin Bar serves up either delightful bowls of sweet vegan-friendly coconut whip, or Hawaiian-style Poke Bowls with a selection of toppings and salad goodies. Create your own custom bowl or have it all – either way, this is guilt-free snacking at its best (with an epic view too!). 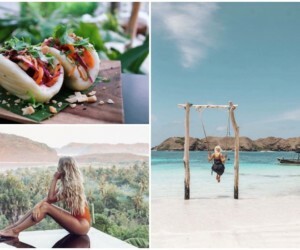 Coco & Poke, Single Fin, Pantai Suluban, Jl Labuan Sait, Uluwatu, p. +62 857 38059709‬. 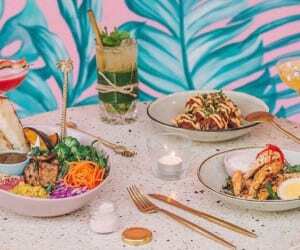 Full of tropical vibes and Hawaiian touches, this beaut Bukit nook serves up an all-day brekky, brunch and lunch menu that is packed full of Polynesian treats – including their signature Ahi Poke Bowl. Meaning ‘to ride waves’ in Hawaiian, He’enalu is the perfect spot for some après surf grinds, not to mention super healthy drinks and ace coffee. He’enalu, Jl Raya Uluwatu Pecatu No. 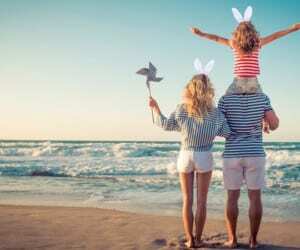 70x, Pecatu, Uluwatu, p. +62 898 8384 180, e. heenalu.bali@gmail.com. Open daily 9am – 9pm. Head to the back of this vintage surf shop and you’ll find a peaceful garden café area with excellent coffee and healthy dishes throughout the day. One of the menu highlights is of course the Tuna Poke Bowl – a reinvention of the classic done right. 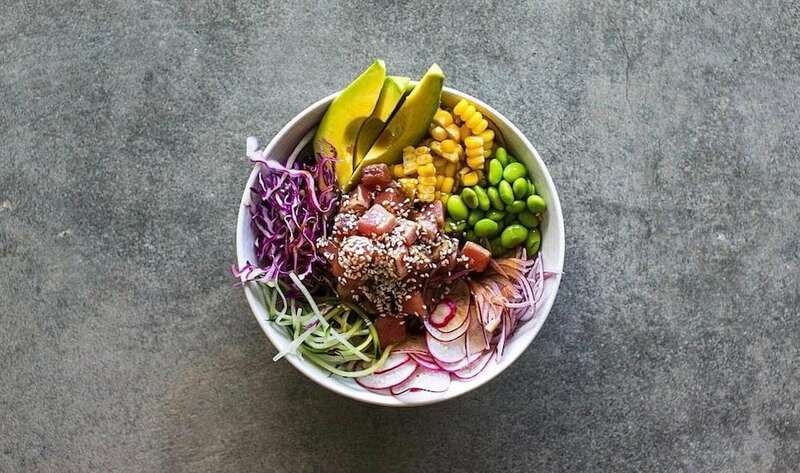 It’s loaded with Mother Nature’s finest creations (avocado, mango, edamame and sesame-marinated local yellowfin) on a mixed bed of brown rice, red barely, mung bean and red millet. Not to mention Aloha vibes all around. Right on! Drifter, Jl Labuansait No.52, Pecatu, p. +62 81 755 7111, e. info@driftersurf.com.